One look outside and you can tell , Summer will be here before we know it, and as we discussed in our last entry, your luxury backyard may already be the ultimate getaway spot. What many do not realize is that the power of Crestron automation can be brought into the backyard, bringing an entirely new level of luxury to this space. We already discussed how Crestron can bring a more robust experience to your backyard pool and today we will be talking about another way Crestron can transform your backyard, with an immersive outdoor theater experience. Outdoor TV’s and distributed video are a huge topic right now in the world of automation. Unfortunately, like many other aspects of the automation world, we regularly find integrators that let down their clients in a variety of ways. The first is with the outdoor television hardware itself. As you may imagine, TV’s that are specifically rated for outdoor use are a significant investment, sometimes costing as much as 5 times more than their non-outdoor rated counterpart. Part of our job as the integration and audio/video professionals is to give our clients an understanding of exactly where their money is going. We often find that proposed outdoor theater spaces are already mostly protected from the elements under some kind of awning or canopy. 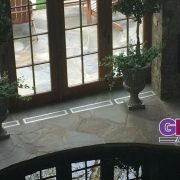 Now, where an average integrator may be the “yes man” and install an outdoor TV set regardless, GMI and the #DoneRightNotEasy crew pride ourselves on being more thorough than that. Part of our job as the integration and audio/video professionals is to give our clients an understanding of exactly where their money is going. Where an average integrator may be the “yes man” and install an outdoor TV set regardless, GMI and the #DoneRightNotEasy crew pride ourselves on being honest with our customers. In this case the real story is that in most circumstances, outdoor TV’s are a waste of money, pigeonholing the client into keeping an expensive set for longer than is needed. As television and video technology continues to grow at an amazing rate, the cost-benefit analysis of an outdoor rated TV simply does not add up. The second issue with backyard video arises in the physical infrastructure used to carry the video from inside the main structure of a home and into the elements of the backyard. We discussed the difficulties of 4K distribution recently in this blog, and bringing this technology into an outdoor location only adds the potential for more issues. To accomplish this, many integrators will simply build out an extension of the copper wiring infrastructure already used inside the home. This could spell disaster for a Crestron control system as soon as an electrical storm begins to move through. 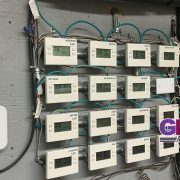 Having interconnected copper wires controlling your outdoor video components means that a single electric shock could resonate through the entire system, causing unforeseen failures. Lightning does not even need to physically strike an outdoor component, even a nearby strike can jump into the copper infrastructure and wreak havoc. To prevent this, GMI and the #DoneRightNotEasy crew insist on exclusively using fiber optic cable anytime a control system crosses over into an outdoor environment. 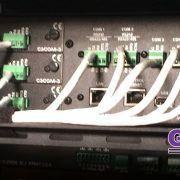 There are many advantages to using a fiber, the most important of which is that it can be used to decouple the outdoor video components from the main system, shielding the control components from an unforeseen electric charge. 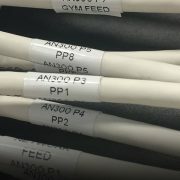 Fiber optic cable is also unique in the fact it is small and versatile enough to be run through many pre-existing electrical conduits, oftentimes eliminating the need unnecessarily tear up your back yard and complicate the project. 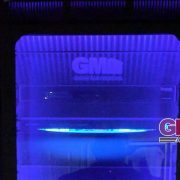 Unlike most integrators, where fiber installation would require an additional sub-contractor on site, GMI takes care of all of our fiber optic installations fully in house. Much like the outdoor vs. standard TV debate outlined above, this allows our systems to be future proof, in so far that when the latest video technology hits the market, the fiber infrastructure already exists and we can upgrade seamlessly upgrade a client’s system. Are you looking to bring distributed video into your luxury backyard? 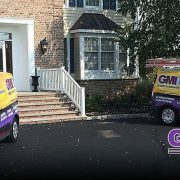 Contact us today to learn more about what GMI can do for you.